We are Joy Lewis and Derrick Hughes, a popular folk music duo based in Sussex who have been playing together for many years. 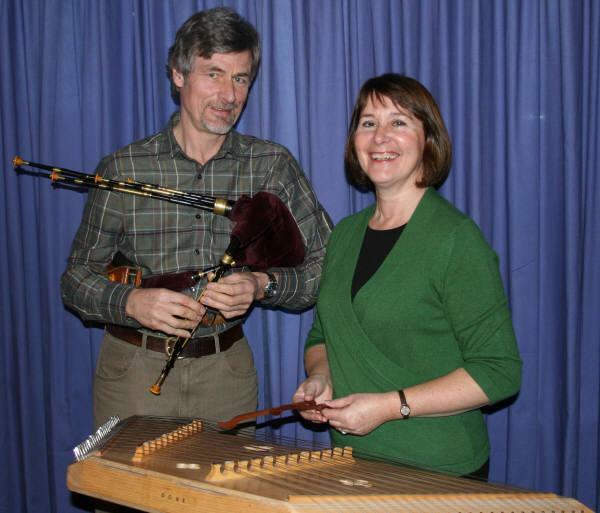 Between us we play a wide variety of instruments including guitar, smallpipes, hammered dulcimer, bowed psaltery, concertina, harp, serpent and an ever-growing collection of recorders and whistles. We play at weddings, concerts, parties and other social gatherings, and also provide musical talks and after-dinner entertainment for many different groups. Whatever the audience, our emphasis is always on entertainment with plenty of humour. Click "Contact" in the menu above to get in touch with us.